The Wilderness: May 5-7, 1864: The opening battle of Grant’s sustained offensive against the Confederate Army of Northern Virginia, known as the Overland Campaign, was fought at the Wilderness, May 5-7. On the morning of May 5, 1864, the Union V Corps attacked Ewell’s Corps on the Orange Turnpike, while A.P. Hill’s corps during the afternoon encountered Getty’s Division (VI Corps) and Hancock’s II Corps on the Plank Road. Fighting was fierce but inconclusive as both sides attempted to maneuver in the dense woods. Darkness halted the fighting, and both sides rushed forward reinforcements. At dawn on May 6, Hancock attacked along the Plank Road, driving Hill’s Corps back in confusion. Longstreet’s Corps arrived in time to prevent the collapse of the Confederate right flank. At noon, a devastating Confederate flank attack in Hamilton’s Thicket sputtered out when Lt. Gen. James Longstreet was wounded by his own men. The IX Corps (Burnside) moved against the Confederate center, but was repulsed. Union generals James S. Wadsworth and Alexander Hays were killed. Confederate generals John M. Jones, Micah Jenkins, and Leroy A. Stafford were killed. The battle was a tactical draw. Grant, however, did not retreat as had the other Union generals before him. On May 7, the Federals advanced by the left flank toward the crossroads of Spotsylvania Courthouse. Although Lee had correctly guessed the locations of the crossings and had been positively informed of the Northern march routes, it was not until midday that he became convinced the Union columns were definitely moving to his right. Only after making that determination did he allow his own various army corps to begin their marches. Orders went out to Ewell (whose men had been standing ready since dawn) to move his 17,000 men east along the Orange Turnpike. At the same time, Lt. Gen. A.P. Hill was told to march his III Corps, some 22,000 strong, east from the Orange Court House area. Deciding to play it safe, Lee ordered Hill to leave one of his divisions, under Maj. Gen. Richard Anderson, to watch the river–just in case the enemy tried to slip behind him. Lee’s remaining infantry corps, Lt. Gen. James Longstreet’s I Corps, had been serving in the Western theater and had only returned in late April. Minus a division on detached duty, the I Corps numbered 10,000 men. It was camped around Gordonsville, 10 miles southwest of Orange Court House. Lee’s operative plan anticipated the three corps forming a continuous north-south line, and Longstreet’s route was designed to bring his men up on Hill’s right flank, even as Hill himself took station off Ewell’s right. Lee had not been able to turn Meade’s force from its course. The leadership exercised by Lee was also mixed. Other than giving direction to the full and partial corps that were struck by the enemy on May 5, Lee had little tactical control over the combat. Thanks to Ewell’s adroit shifting of resources and the nullifying effects of the Wilderness on Hancock’s late-afternoon attack against Hill, the Confederate army barely managed to survive a bad day. The record for May 6 was not much better. Lee’s failure to better prepare Hill’s men for Hancock’s dawn attack nearly began the day with a disastrous rout. After Longstreet’s wounding, Lee’s insistence on a late-afternoon assault along the Orange Plank Road resulted in the loss of thousands of valuable men. The Wilderness had triumphed over Lee on those two days. In the gloomy, smoke-filled forests, not even Robert E. Lee had been able to pierce the fog of war. It consisted of men at the lower and upper ends of conscription age. The exact date of their organization is unknown, but they existed at least as early as February, 1864 when they participated in the Battle of Olustee. During the spring of 1864 a number of companies of "Florida Reserves" were raised for service within the state. These companies eventually were formed into the First Florida Reserve Regiment. Jesse enlisted in the 4th Ga. Cavalry, Co. H., from Coweta Co. on Oct 2nd 1862. After training, served with Col Avery. Company "H" was not organized until Nov. 16, 1862, the regiment being camped at Dalton, GA on Dec. 16, 1862. Evidently, this regiment became attached to the Army of Tennessee under the command of Gen. Braxton Bragg in the defense of central Tennessee in 1862 and 1863. Was organized on April and July 1861 and mustered into Confederate service for 12 months near Jacksonville, Floridaon July 13, 1861 and joined Lee's Army of Northern Virginia in the late summer. They fought at the Battles of Williamsburg, Seven Pines, Gaines Mill, and Malvern Hill in 1862. In late 1862, the 2nd Florida Infantry Regiment was assigned to E.A. Perry's newly formed Florida Brigade alongside the 5th and 8th Florida. Perry's Brigade served under Anderson’s Division of Longstreet’s First Corps, of the Army of Northern Virginia. They fought in the Battles of Second Manassas, Sharpsburg, and Antietam from Aug-Sep 1862. Colonel David Lang took command of the Florida Brigade and led them at Fredricksburg in Dec 1862 and Chancellorsville in May 1863. Under Col. Lang's command the Florida Brigade fought at Gettysburg in July 1863. They were attached to Picket's Division, and took part in the famous attack on the Union center on the 3rd day. After the Battles of the Wilderness and Spotsylvania in 1864, the Brigade was joined by the victors of the Battle of Olustee, the 9th, 10th, and 11th Regiments. General Joseph Finegan, the famous commander of Florida forces at Olustee, took command of the Florida Brigade, then known as “Finegan’s Brigade”. In the last year of war the Florida Brigade fought at Cold Harbor in June 1864 and Petersburg during the winter. The Florida Brigade retreated with the Army of Northern Virginia and surrendered at Appomattox Courthouse on April 9, 1865. By the time of surrender, the regiments were the size of modern day platoons or companies. The 2nd surrendered 68 soldiers. Given Names: William Grissom, Jr. Numerous Cone family members were in The War of 1812, Rev War, Seminole Wars & members of the CSA. The first 29th Infantry was constituted on 29 January 1813, and saw service in the War of 1812. The second 29th Infantry was constituted on 3 May 1861. The 29th Infantry Regiment, organized at Big Shanty, Georgia, during the summer of 1861, contained men from Thomas, Berrien, Tift, Stephens, and Dougherty counties. For a time Companies A and G served as heavy artillerists in the Savannah area and the rest of the command was at Charleston. It then was assigned to General Wilson's, C.H. Stevens', and H.R. Jackson's Birgade, and in September, 1863, was consolidated with the 30th Regiment. The unit participated in the difficult campaigns of the Army of Tennessee from Chickamauga to Atlanta, endured Hood's winter operations in Tennessee, and fought at Bentonville. In December, 1863, the 29th/30th totalled 341 men and 195 arms, but few surrendered on April 26, 1865. The field officers were Colonels W.D. Mitchell, R. Spaulding, and William J. Young; Lieutenant Colonels T.W. Alexander and W.W. Billopp; and Majors Levi J. Knight, John C. Lamb, and John J. Owen. The 50th Georgia Volunteer Infantry was an infantry regiment raised by the state of GA to fight for the Confederacy in the American Civil War. This regiment was formed in March 4th, 1862, in Savannah, Georgia, primarily from recruits from southern Georgia. The original commander was Col. William R. Manning (1817-1871). They were drilled at Camp Davis, just outside of Guyton, GA. Upon being mustered into service, the regiment served in the Savannah defenses. On July 17, 1862, Major General John C. Pemberton sent the 50th Georgia Volunteers to Richmond to join the Army of Northern Virginia under its commanding general, Robert E. Lee. It served with the Army of Northern Virginia from July 1862 until its surrender at Appomattox Court House, except during Longstreet's 1863 expedition to Georgia and Tennessee. Upon reaching Virginia, it was assigned to Drayton's Brigade. During the Battle of Antietam, the regiment was assigned to Toombs Brigade (in the South this battle is known as the battle of Sharpsburg), after the nearby town. Toomb's Georgia troops were credited with defending the bridge over Antietam creek against several ill fated attempts to cross it, until finally being pushed back late in the afternoon. After the battle, the 50th Regiment was permanently assigned to Paul Jones Semmes's Brigade. The subsequent brigade commanders were Goode Bryan and James P. Simms. The first Confederate pensions in Florida were authorized in 1885 and granted to veterans the sum of $5.00 per month. The next three decades saw a new Confederate pension bill introduced at nearly every session of the Legislature. Residency requirements were added and adjusted, militia members and widows were declared eligible, various financial qualifications were added and changed, and the amount and method of distribution were changed many times. A Board of Commissioners consisting of three members was appointed under the first pension law and it remained essentially the same, despite changes in name and the inability of the legislature to settle on the identity of the third member. The Governor and Comptroller were members of the board from the beginning, although the third seat was passed at various times from the Adjutant General to the Secretary of State to the Attorney General to the Treasurer, back to the Attorney General, and again back to the Treasurer before finally stabilizing in 1915 as the Governor, Comptroller, and Treasurer. The clerical and day-to-day operations of administering the pension laws were carried out under the supervision of the Comptroller. The pension application files include both veterans' and widows' applications interfiled, although approved and denied claims are filed separately. The veteran's application generally includes his full name, date and place of birth, unit of service, date and place of enlistment, date and place of discharge, brief description of service and/or wounds, proof of service, place and length of residence in Florida, as well as other miscellaneous documentation. 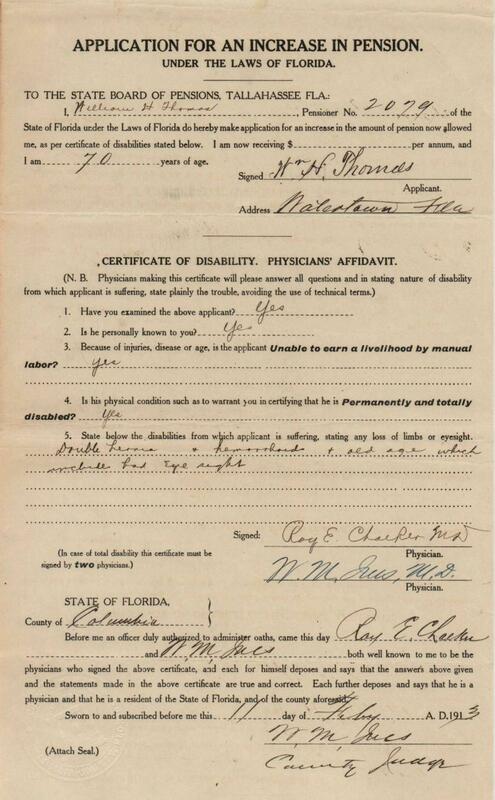 The widow's application is filed with that of her husband and includes her full name, date and place of marriage, date and place of her husband's death, her place and length of residence in Florida, and proof of her husband's service. Some early applications also include the widows' date and place of birth. Confederate pensions were awarded to residents of Florida regardless of the state in which their service was rendered. On 05/15/1862, Emanuel Waters enlisted into the Confederate Army. He was a member of the 8th Regiment. Florida Infantry – Company C. This unit was a part of Perry’s Brigade, which was a part of Anderson ’s Division. Anderson ’s Division, Commanded by Maj. Gen. Richard H. Anderson was under the Third Army Corps, which was commanded by Lt. Gen. Ambrose P. Hill. Hill’s commander was Robert E. Lee. Emanuel was injured in the right hip area during a skirmish at the "Wilderness" on May 6th, 1864, when his unit was flanked and was ordered to fall back. By all evidence, it was late in the day. He was absent/sick and hospitalized on the last muster roll. The series of battles began on May 4th, 1864, about 18 miles west of Fredericksburg, VA, and lasted three days. When he applied for pension. It describes the incident that injured him, that he was not hit by enemy fire but sustained a serious rupture on the left side and paralysis of the right leg by falling backwards over a pile of logs after being ordered to fall back when the Federal Troops flanked his unit on the left. The paralysis was caused by an injury to his lower back at about the area where the pelvis is joined. He was released from capture April 9th, 1865 in Richmond, VA. The 8th Infantry Regiment-Company C, completed its organization at Lake City, Florida, during the summer of 1862. Its members were raised in the counties of Walton, Washington, Jackson, Santa Rosa, Escambia, Leon, and Gadsden. The unit was soon ordered to Virginia with a force of 950 men, and brigaded under Generals Pryor, E.A. Perry, and Finegan. It was prominent in numerous battles from Second Manassas to Cold Harbor , endured the hardships of the Petersburg trenches south of the James River, and fought in various conflicts around Appomattox . The regiment reported 7 killed, 37 wounded, and 44 missing at Fredericksburg , had 11 killed and 28 wounded at Chancellorsville , and lost fifty-nine percent of the 176 engaged at Gettysburg . Only 4 officers and 28 men surrendered with the Army of Northern Virginia. Soon after the Chickahominy campaign the Fifth and Eighth Florida regiments of infantry arrived in Virginia and were assigned to Pryor's brigade, otherwise composed of the Second Florida, Twelfth Virginia and Fourteenth Alabama. The Eighth regiment, under command of Col. R. F. Floyd, included the companies commanded by Captains Worth of Hillsboro, Tucker of Madison, B. A. Bobo of Madison; William Baya of St. John's, R. A. Waller of Gadsden, Stewart of Orange, F. Simmons of Nassau, David Lang of Suwannee, Pons of Duval, T. E. Clarke of Jackson; Dr. Richard P. Daniel was surgeon. The Second, Fifth and Eighth regiments fought together first in the great battle of Second Manassas August 30, 1862, where, as General Pryor reported, "the Fifth and Eighth Florida regiments, though never under fire before, exhibited the cool and collected courage of veterans." Crossing the Potomac near Leesburg early in September, the brigade marched through Frederick City, over South mountain into Pleasant valley, and participated in the investment and capture of the Federal forces a! Harper's Ferry. Hurrying then to the field of Sharps-burg, they shared the service of R. H. Anderson's division in the battle of September 17th. In this engagement Colonel Hateley and Lieutenant-Colonel Lamar, of the Fifth, were severely wounded. The Florida 7th Infantry Regiment was organized at Gainesville, Florida, in April, 1862. Its companies were recruited in the counties of Bradford, Hillsborough, Alachua, Manatee, and Marion. During the war it served in R.C. Trigg's, Finley's, and J.A. Smith's Brigade, Army of Tennessee. The 7th took an active part in the arduous campaigns of the army from Chickamauga to Nashville , then fought its last battle at Bentonville . It sustained few casualties at Chickamauga and in December, 1863, totalled 278 men and 206 arms. The unit surrendered on April 26, 1865. Lieutenant Colonel Tillman Ingram Major Nathan S.
A Private in the 50th Georgia Infantry Company A: 50th Infantry Regiment was organized at Savannah, GA, during the spring of 1862. Its members were recruited in the counties of Ware, Coffee, Lowndes, Thomas, De Kalk, Clinch, Colquitt, Berrien and Brooks. After serving in the District of Georgia, the 50th moved to Virginia and was assigned to General Drayton's, Semmes's, Bryan's, and Simms' Brigade. It participated in the campaigns of the Army of Northern Virginia from Second Manassas to Gettysburg, then was ordered back to Georgia. However, the unit did not arrive in time to share in the Battle of Chickamauga. It was involved in the Knoxville operations and later the conflicts at The Wilderness, Spotsylvania, and Cold Harbor. The regiment fought with Gen. Early in the Shenadoah Valley and ended the war at Appomattox. There were 29 killed and 97 wounded at Sharpsburg and 17 killed and 153 wounded at Chancellorsville. It lost thirty percent of the 302 engaged at Gettysburg, had many disabled at Sayler's Creek. He was captured at Cedar Creek Virginia on October 19, 1864, and surrendered with 1 captain, 2 lieutenants, 2 surgeons, and 25 men. The field officers were Colonels William R. Manning and Peter McGlashan; Lieutenant Colonels William O. Fleming, Francis Kearse, and Pliny Sheffield; and Majors DuncanCurry, P.C. Pendleton, and John M. Spence.He was paroled at Point Lookout, Maryland. From there he was transferred for exchange on February 13, 1865. Received at Boulware & Cox's Landing, James River, Virginia. Operation against Sheridan's Trevillian Raid, Va. Engagement, Trevillian Station, Central R.R., Va. Action, Newark (Mallory's Cross Roads), Va. Siege Operations against Petersburg and Richmond, Va. Engagement, Sappony Church (Stony Creek), Va. Engagement, Ream's Station, Va. Battle, Weldon R.R., Globe Tavern (Yellow House) and Black's Station (Six Mile House), Va. Battle, Ream's Station, Va. Battle, Popular Springs Church Peeble's Farm Pegram's Farm, and Laurel Hill, Va. Engagement, Fair Oaks and Darbytown Road, Va. Operations against Warren's Expedition to Hicksford, Va. Appomattox Campaign Action, Namozine Church, Va. Skirmishes near Amelia Court House, Va. Skirmish, Tabernacle Church (Beaver Pond Creek), Va. Engagement, Amelia Springs, Va. Action, High Bridge, Va. Engagement, Farmville, Va. Engagement, Appomattox Station, Va. Engagement, Clover Hill, Appomattox Court House, Va. Surrender, Appomattox Court House, Va.
ust prior to moving to Northern Virginia. Afterwards he was present for the duration of the war. On April 9, 1865, Pvt. B.J. Waters surrendered at Appomattox Courthouse, Va. along with the remaining members of the 7th. (Surrendered / paroled April 1865 Appomattox)﻿. The company Captain was: Co. H, John P. Hines; From Co. B, "Hardwick Mounted Rifles". the fight and brought out three hundred only.”Lt. Col. Waring, commander of the Jeff Davis Legion, dismounted a “good many men to support General Butler. As Waring’s command and the Georgians of the 20th Battalion of Georgia Cavalry pitched into the fray, so too did most of the men of the 7th Georgia Cavalry and Cobb’s Legion. The additional men made an immediate impact; Hampton later noted that these two brigades pushed the enemy steadily back, and I hoped to effect a junction with Lee’s division at Clayton’s Store in a short time﻿.